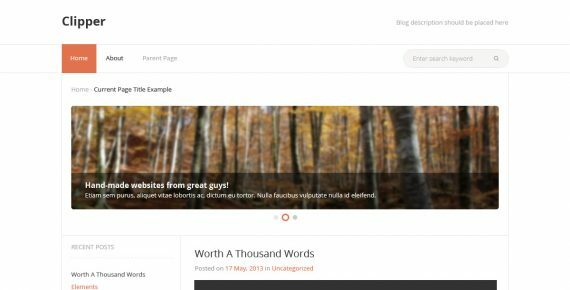 If you are looking for a breakthrough beautiful and easy-to-use WordPress PSD template, Clipper will be a great choice. This template features an elegant slider, plenty of space to be filled with images, videos and ads, and a perfectly balanced color scheme. Clipper will be a great helper in promoting your products or services. 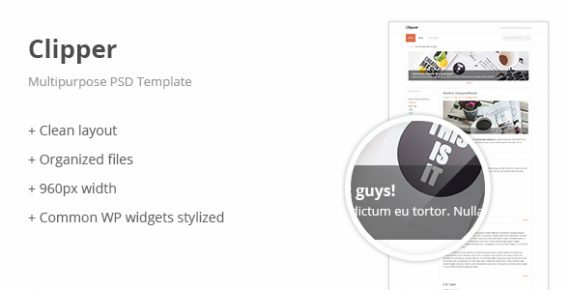 Clipper is a fresh and minimalistic PSD template that has a clean and well-structured layout. With this airy template your website will not be overcrowded by excessive visual elements, which will be best-suited for business and eCommerce websites, portfolios or personal pages. Clipper has been made compatible with all popular browsers, which is will be a bonus if your website is meant for a diverse audience. Technologies used: 960gs, Adobe Illustrator, Adobe Photoshop, Graphic design. We recommend to download and instal these fonts before editing your PSD files. Use unique styles and various elements to create your personal website interface! Use, by you or one client, in a single end product which end users are charged for. Template cannot be used for commercial projects. You may copy, distribute, display, and perform the work and make derivative works based on it only for noncommercial purposes. One license per user is available. You must include copyright information such as company name and link to website (i.e., Designed by BestWebSoft). Please enter a valid email address and we will send you the download link.